Landry Fields is easily one of the most personable guys on the Knicks right now. 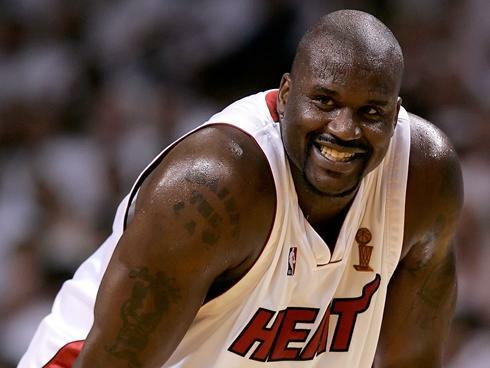 From his hilarious YouTube videos with Andy Rautins to his moves on the court, he's definitely one to watch. The Knicks would be crazy to trade such an exciting player for higher picks in this years not so stellar draft. 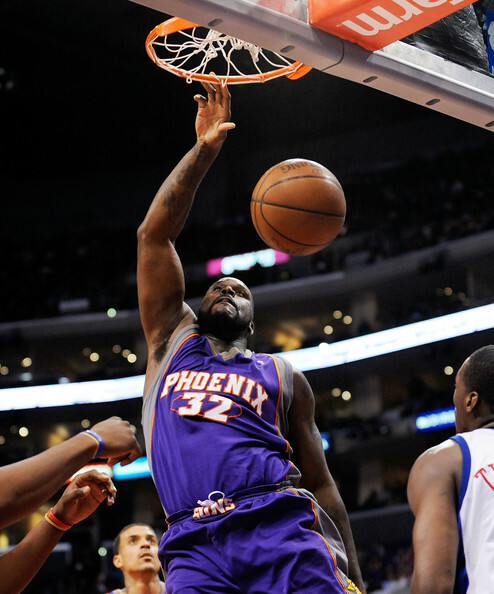 Check out this interview Fields did with Slamonline.com. What's not to like about this guy? 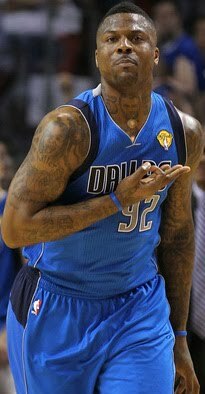 Yes the Mavs are the champions...just DeShawn Stevenson got hit with public intoxication in the wake of all the celebration. This is a "shot" he will never forget. 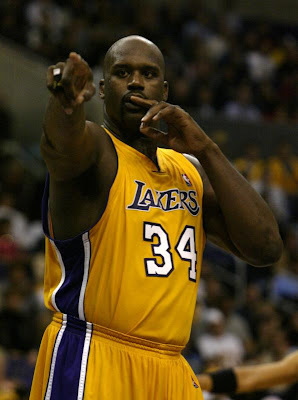 Arrested NBA Champion, yea we'll have to remember that also. 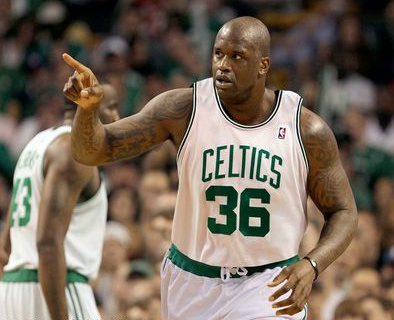 Ok So Stevenson didn't know where he was. The officers ask him if he had just won a NBA Championship? If you've been anywhere near a college campus you know what this is. 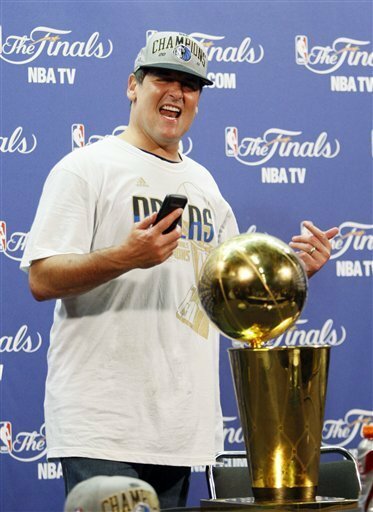 Winning a championship can be related to having to release the bladder when the water bill is extremely due. Now mix those two and it can be quite a relief. 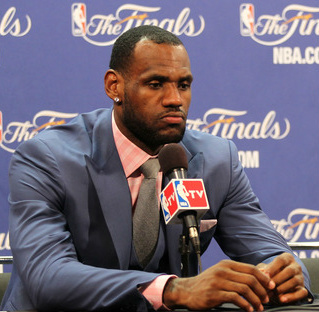 Lebron spoke some pretty truthful words in his post Finals lost presser, which he has since clarified. 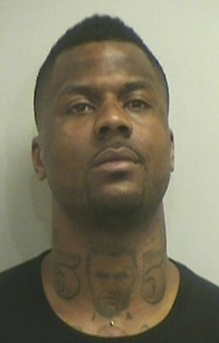 You had to expect this from DeShawn Stevenson, as he and LeBron aren't the best of buddies. And to top it off.... just "Take Dat Wit Chew"... Tyson Chandler and Dirk Nowitzki in this Ultimate Fan mix. Oh nothing much going on over there but a championship celebration. 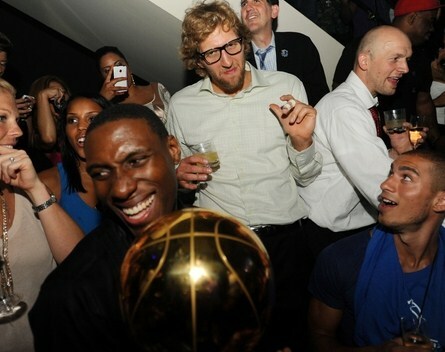 Jet, Dirk and Cardinal doing exactly that,celebrating a championship on South Beach. 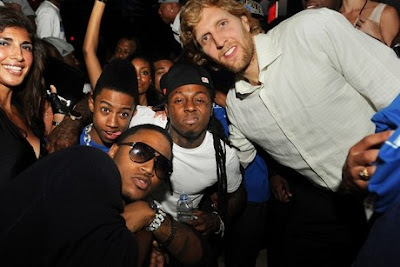 Hornets supporter and Lakers fan Lil' Wayne with the current Champion. We can hear that bar soon, just wait. 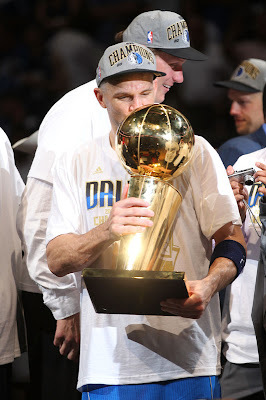 Then he brought back to it's city and state of residency, Big D in TX! Aight Dirk keep doing it! 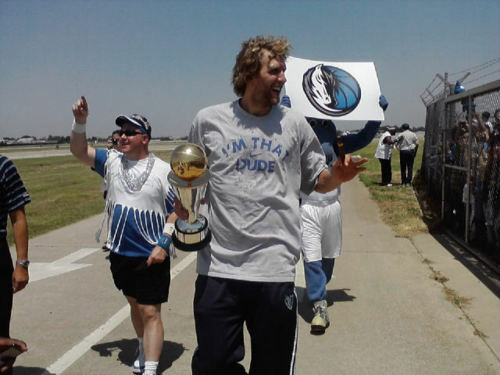 After his emotions were cleared and he had recieved all of the hardware, Dirk was ready to invade South Beach party scene and did. 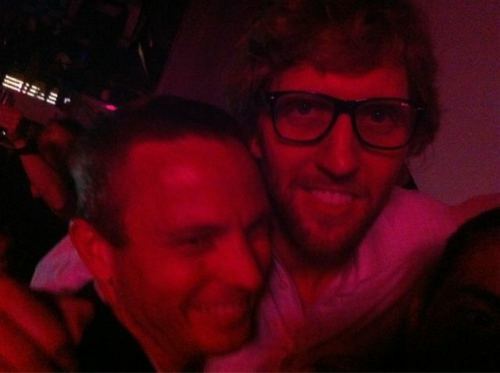 Dirk was at LIV in Miami afterwards. 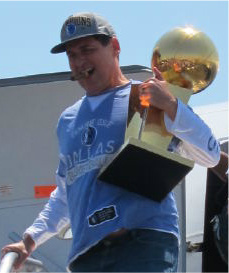 Of course the trophy was there with him since it was the most prized possesion lacked in Dirk's career and the reason to party it up. 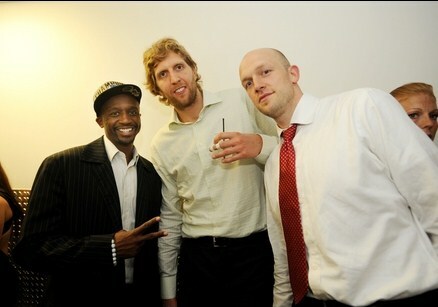 Yeaaa there you go Dirk! Bottoms Up...the whole bottle! Jeff Wade knew where to be! 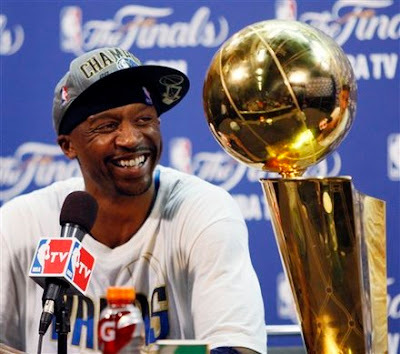 Not your average NBA Champion huh, just cool relaxed and enjoying the moment. 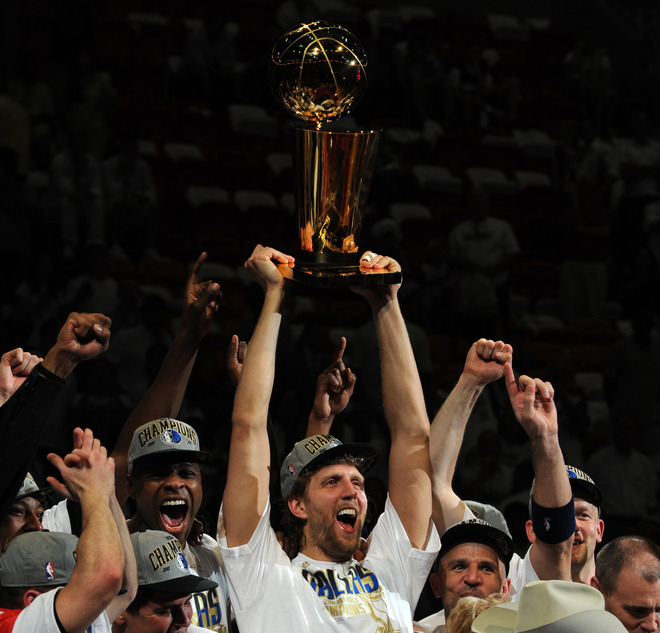 Only one team can end their season with the Larry O'Brien Trophy. 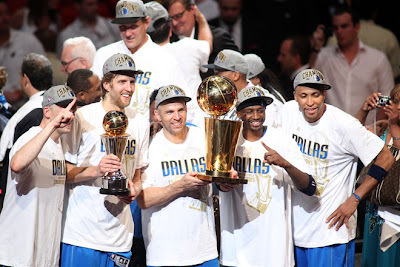 This 2010-2011 Champions are the Dallas Mavericks hands down. Torn Tendons, massive combacks, horrid shooting slumps, prolific foul shooting were all apart of the Mavericks 4 games to 2 win int he NBA Finals over the Miami Heat. After two empty trips to the NBA Finals the third was a charm for Jason Kidd, as the 16 year veteran won his first championship of his career with the team and city that drafted him with the 2nd pick in 1994. Lastly the greatest European player this side of the late Drazen Petrovic lifts that trophy high into the air. 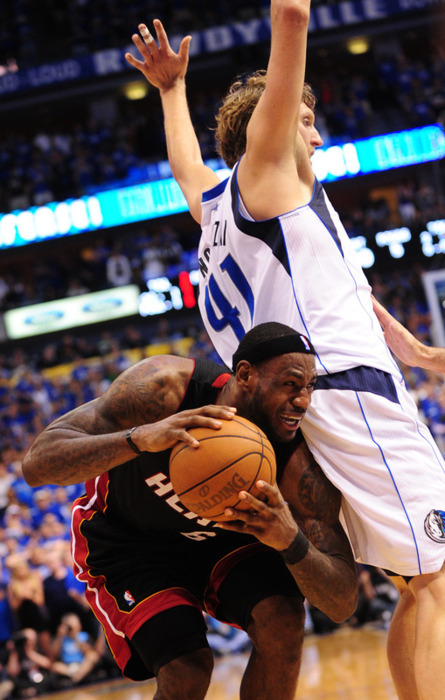 Dirk had taken more Heat, no pun intended, than a little bit since the Finals and playoff collaspes the past few seasons. Dirk was so emotion he wasn't even on the floor when the final horn sounded and had to be talked into coming out to celebrate! 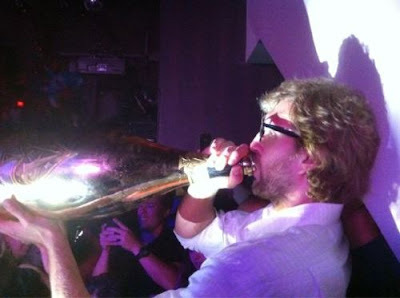 Dirk you won, live it up. You defeated Hollywood, no go make your movie! Congrats to the Mavericks on their Championship Win! 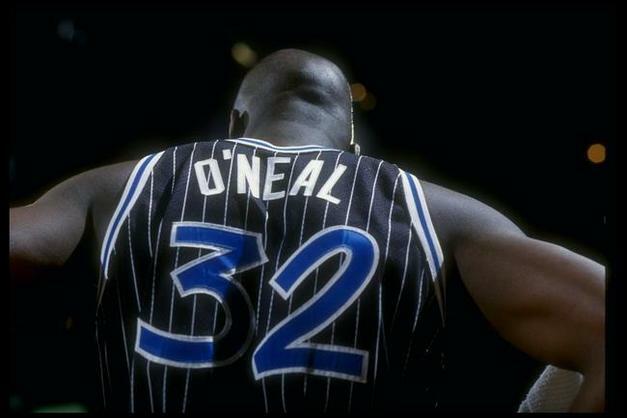 All in all love him or hate him he, made you laugh, dominated the paint, clanked free throws and won those championships. 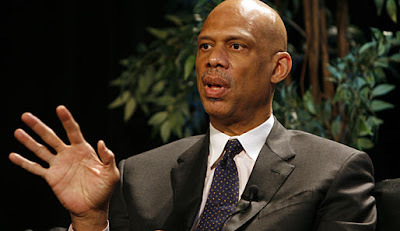 He didn't change any rules in the paint but he made the engineers of the basket work to prevent him from pulling down the shot clock on his head again, meaning once he could demand the double team it was time to go. 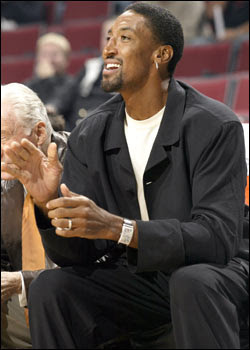 Look for him in a broadcast booth? Come'on you know you'd listen to that commentary next season. He's won and played with other stars that will fill out HD viewing and listening pleasures enroute to their championship pursuit.